Quintela, F. M., Porciuncula, R. A., Condini, M. V. L., Vieira, J. P. & Loebmann, D. Composi��o da ictiofauna durante o per�odo de alagamento em uma mata paludosa da plan�cie costeira do Rio Grande do Sul, Brasil. Pan-American Journal of Aquatic Sciences, 2(3): 191-198. Download PDF file (321 Kb). Fernandes, L. D. A., Souza M. F. & Bonecker, S. L. C. Morphology of Oplophorid and Bresiliid larvae (Crustacea, Decapoda) of Southwestern Atlantic plankton, Brazil. Pan-American Journal of Aquatic Sciences, 2(3): 199-230. Download PDF file (3,643 Kb). Silva, F. L., Moreira, D. C., Bochini, G. L. & Ruiz, S. S. Desempenho de dois �ndices biol�gicos na avalia��o da qualidade das �guas do C�rrego Vargem Limpa, Bauru, SP, atrav�s de macroinvertebrados bent�nicos. Pan-American Journal of Aquatic Sciences, 2(3): 231-234. Download PDF file (36 Kb). Bonecker, A. C. T., Castro, M. S., Namiki, C. A. P., Bonecker, F. T. & Barros, F. B. A. G. Larval fish composition of a tropical estuary in northern Brazil (2�18�-2�47�S/044�20�- 044�25�W) during the dry season. Pan-American Journal of Aquatic Sciences, 2(3): 235-241. Download PDF file (156 Kb). Cognato, D. P., Giora, J. & Fialho, C. B. An�lise da ocorr�ncia de les�es corporais em tr�s esp�cies de peixe el�trico (Pisces: Gymnotiformes) do sul do Brasil. Pan-American Journal of Aquatic Sciences, 2(3): 242-246. Download PDF file (154 Kb). Bello-Pineda, J. & Hern�ndez-Stefanoni, J. L. Comparing the performance of two spatial interpolation methods for creating a digital bathymetric model of the Yucatan submerged platform. Pan-American Journal of Aquatic Sciences, 2(3): 247-254. Download PDF file (244 Kb). Carranza, A., Scarabino, F., Ortega, L. & Sauco, S. Geographic and bathymetric distribution of Americominella duartei (Neogastropoda: Buccinidae), a bathyal species from the Southwestern Atlantic. Pan-American Journal of Aquatic Sciences, 2(3): 255-260. Download PDF file (157 Kb). Gazola-Silva, F. F., Mott, T., Garey, M. V. & Vitule, J. R. S. Chthonerpeton viviparum Parker & Wettstein, 1929 (Amphibia, Gymnophiona, Typhlonectinae) in Paran� state, Brazil and the first record of predation of this species by Hoplias malabaricus (Bloch, 1794) (Actinopterygii, Erythrinidae). Pan-American Journal of Aquatic Sciences, 2(3): 261-262. Download PDF file (58 Kb). Arantes, C. C., Castello, L. & Garcez, D. S. Varia��es entre contagens de Arapaima gigas (Schinz) (Osteoglossomorpha, Osteoglossidae) feitas por pescadores individualmente em Mamirau�, Brasil. Pan-American Journal of Aquatic Sciences, 2(3): 263-269. Download PDF file (79 Kb). Dias, C. de O. & Bonecker, S. L. C. Study of Monstrilloida distribution (Crustacea, Copepoda) in the Southwest Atlantic. Pan-American Journal of Aquatic Sciences, 2(3): 270-278. Download PDF file (233 Kb). Condini, M. V., Garcia, A. M. & Vieira, J. V. Descri��o da pesca e perfil s�cio-econ�mico do pescador da garoupa-verdadeira Epinephelus marginatus (Lowe) (Serranidae: Epinephelinae) no Molhe Oeste da Barra de Rio Grande, Rio Grande do Sul, Brasil. Pan-American Journal of Aquatic Sciences, 2(3): 279-287. Download PDF file (714 Kb). Medeiros, P. R., Grempel, R. G., Souza, A, T., Ilarri, M. I. & Sampaio, C. L. S. Effects of recreational activities on the fish assemblage structure in a northeastern Brazilian reef. Pan-American Journal of Aquatic Sciences, 2(3): 288-300. Download PDF file (214 Kb). Souza, A, T. & Medeiros, P. R. Lytechinus variegatus (Lamarck) (Echinodermata, Toxopneustidae), covering behavior. 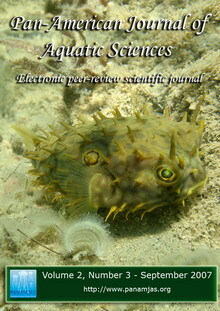 Pan-American Journal of Aquatic Sciences, 2(3): I. Download PDF file (125 Kb). Dias, T., Borges, J., Moura, E., Guedes, S. & Damasceno, L. C. Predation of the sea anemone Bunodosoma cangicum Corr�a, 1964 (Cnidaria, Anthozoa, Actiniidae) on a swimming crab Callinectes sp. Stimpson, 1860 (Decapoda, Brachyura, Portunidae). Pan-American Journal of Aquatic Sciences, 2(3): II. Download PDF file (93 Kb). Copyright 2006-2018 - Page created by Jorge Pezaroglo - Web-Designer and Consultant. Photographs by Daniel Loebmann and Jose P. Irigoyen. Site Managers: Daniel Loebmann & Gonzalo Velasco.